A tropical cyclone is a circular air movement over the warm ocean waters in the warm part of Earth near the equator. Most tropical cyclones are storms with strong winds and heavy rains. While some tropical cyclones stay out in the sea, others pass over land. This can be dangerous because the winds and floods can break things and drown people. Tropical cyclones form when warm, moist ocean air rises. They begin as a group of storm winds when the water gets as hot as 80 °F (27 °C) or hotter. The Coriolis effect causes the winds to rotate. These storms usually move westward in the tropics, and later move north or south into the temperate zone. 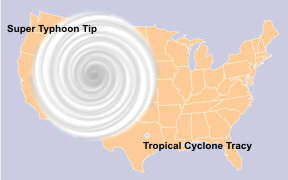 The term "tropical cyclone" is a general term and includes regionally specific terms such as "hurricane" and "typhoon". A tropical cyclone that forms in the Atlantic is called a hurricane. The same is true of those that form in the eastern, central and northern Pacific. In the western Pacific a tropical cyclone is called a typhoon. In the Indian Ocean they are called "cyclones". The name for a tropical cyclone depends on its location. For several hundred years hurricanes were named after saints. In 1887, Australian meteorologist Clement Wragge began giving women's names to tropical cyclones. He drew on history and mythology for names. When he used men's names, they were usually of politicians he hated. By World War II these names were based on the phonetic alphabet (Able, Baker, Charlie). In 1953 the United States stopped using phonetic names and began using female names for these storms. This ended in 1978 when both male and female names were used for Pacific storms. 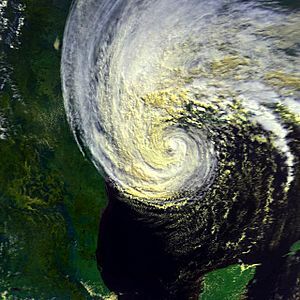 In 1979 the practice was extended to hurricanes in the Gulf of Mexico and the Atlantic. In the past these storms sank many ships. Better weather forecasting in the 20th century let most ships avoid them. When tropical cyclones reach land, they may break things. Sometimes they kill people and destroy cities. In the last 200 years, about 1.5 million people have been killed by tropical cyclones. 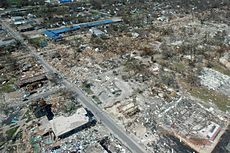 Wind can cause up to 83% of the total damages of a storm. Broken wreckage from destroyed objects can become deadly flying pieces. Flooding can also occur when rainfalls and/or storm surges pour water onto land. Tropical cyclones are classified into different categories depending on their strength and location. The National Hurricane Center which observes hurricanes in the Atlantic Ocean and Eastern and Central Pacific Ocean classify them into the Saffir-Simpson Hurricane Scale. Tropical cylones in other places such as the Western Pacific Ocean or the Southern Hemisphere are classified on similar scales. For example; if a tropical storm in the western Pacific reaches hurricane-strength winds, it is then officially recognized as a typhoon. A tropical depression is an organized group of clouds and thunderstorms with a clear surface circulation and maximum sustained winds of less than 17 m/s (33 kt, 38 mph, or 62 km/h). It has no eye and does not usually have the spiral shape of more powerful storms. Only the Philippines are known to name tropical depressions. A tropical storm is an organized system of strong thunderstorms with a very clear surface circulation and maximum sustained winds between 17 and 32 m/s (34–63 kt, 39–73 mph, or 62–117 km/h). At this point, the cyclonic shape starts to form, although an eye does not usually appear in tropical storms. Most tropical cyclone agencies beginning naming cyclonic storms at this point, except for the Philippines which have their own way of naming cyclones. A hurricane or typhoon is a cyclonic weather system with sustained winds of at least 33 m/s (64 kt, 74 mph, or 118 km/h). A tropical cyclone of this strength usually develop an eye, an area of calm conditions at the center of circulation. The eye is often seen from space as a small, round, cloud-free spot. Surrounding the eye is the eyewall, an area in which the strongest thunderstorms and winds spin around the storm's center. The fastest sustained windspeed founded in tropical cyclones is thought to be 85 m/s (165 kt, 190 mph, 305 km/h). Typhoon Nabi as seen from the International Space Station, on September 3, 2005. "Hurricane Hunter" - WP-3D Orion used to go into the eye of a hurricane for data collection and measurements purposes. Tropical cyclone Facts for Kids. Kiddle Encyclopedia.